A Panasonic model will always be an Olympus camera’s closest competitor, given that both camera ranges use the four thirds system. However, looking over the specifications of the Panasonic Lumix cameras, the budget-level GF6 is quite similar to the E-P5 in many areas, with same resolution sensor, a rear tilting LCD touchscreen and built-in Wi-Fi. On the style and price front, however, the Fujifilm X-E1 is closest. It has a larger APS-C sensor and built-in EVF, but its handling and lens choice is currently more limiting. 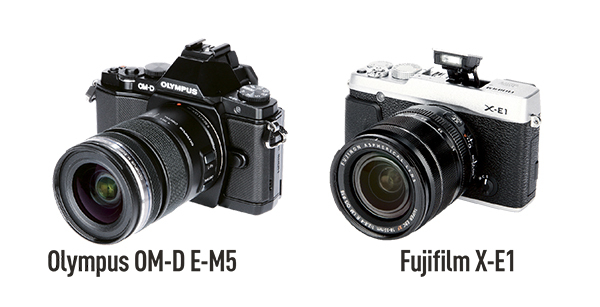 Another competing model is Olympus’s own OM-D E-M5, because it is similar to the E-P5 in so many ways and is, at the time of writing, a close match in price. Both are among the most stylish CSCs on the market. The key difference, as outlined in Features in use, VF-4 EVF, is the OM-D’s built-in viewfinder and therefore different shape, while the E-P5 uses the optional VF-4 EVF unit.